The Aussie fell sharply in Asia on Thursday following short-lived advance to 0.7166 on better than expected Australian jobs data, coming under increased pressure after NAB raised domestic mortgage rates. 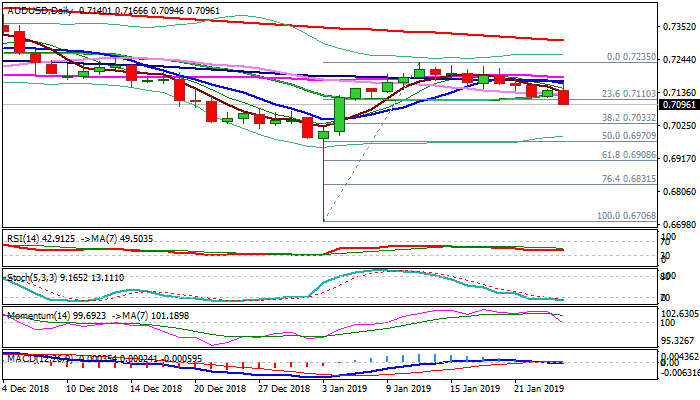 Fresh bearish acceleration broke below 20SMA (0.7125) that contained the action of past two days and opened way towards support at 0.7033 (Fibo 38.2% of 0.6706/0.7235). Momentum is breaking into negative territory on daily chart and supports the notion, while slow stochastic continues to heads south in deep oversold zone and lacks for now any positive signal. Broken 20SMA marks initial resistance, ahead of 10SMA (0.7170) which should cap extended upticks and keep bears in play. Caution on lift above 10SMA as daily cloud twists on Friday and could attract bulls.